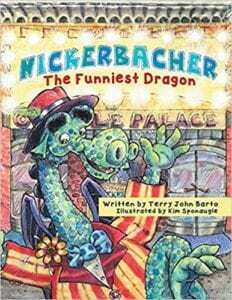 Nickerbacher is a very obedient young dragon. He spends his time guarding Princess Gwendolyn because his father told him to. Nickerbacher keeps the princess safe but he isn’t happy – he knows he was meant for the comedy stage. The young dragon passes his time by telling the princess jokes and loves it when she laughs. Gwendolyn is a smart princess and tells her dragon friend, “...you need to do what makes you happy.” But then Papa Dragon comes along and reminds Nickerbacher of his duty. “You’re not supposed to make people laugh…you’re supposed to scare them,” he growls. Will Nickerbacher ever be happy? One day a prince arrives to do battle with Nickerbacher. The prince wants to fight the deadly dragon and rescue the princess but he doesn’t know this dragon. Nickerbacher has other ideas. Instead of being a fierce and frightful dragon, he jokes with the prince. Frustrated, the prince tries and tries to fight Nickerbacher but eventually realizes that this dragon is different; he’s not a fire-breathing monster. When the prince reveals that he too, has a dream, the two become friends and talk about their dreams. Will the encouragement of the prince and princess be enough to encourage Nickerbacher to ‘go for it’ and reach for his dream? Nickerbacher: The Funniest Dragon is probably the most unique rendition on the ‘reach for your dreams’ story I’ve read. I love how the author took a creature normally portrayed as fierce and dangerous and turned him into a lovable friend (to both the princess and the reader) who wanted nothing more than to be happy. Young readers will get to see what happens when Nickerbacher reaches for the stars (and his dream) and will be encouraged to reach for their dreams too. Overall, a very enjoyable story that teaches an important lesson. 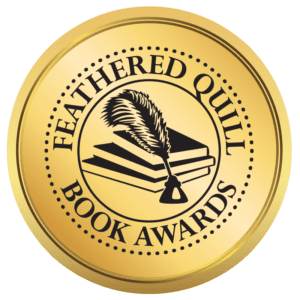 Quill says: Nickerbacher: The Funniest Dragon is a unique twist on the theme of staying true to your dreams.